Various solar power project finance models are available for download below that forecast the financing and operation of solar power investments. The solar project finance modelling files quantify the effects of financing and costs on the required price in a solar project finance model. The solar power project finance models include resource analysis that is explained in video presentation. The first solar project finance model is comprehensive with scenario analysis, resource analysis and complex finance options. Whilst this solar project finance model was made a couple of years ago and does not include my some of my newest techniques, it does include functions to resolve circular reference. By resolving circular references with a UDF, bid prices can be evaluated with different financing techniques such as sculpting, DSRA LC’s, re-financing and many other factors. The second solar project finance model is a simpler file that was is used to evaluate a project in Mexico where some flows are in USD and others are in MXN. This project finance model also includes resource assessment from different sources and a detailed cost breakdown. This model is probably easier to follow than the first example. 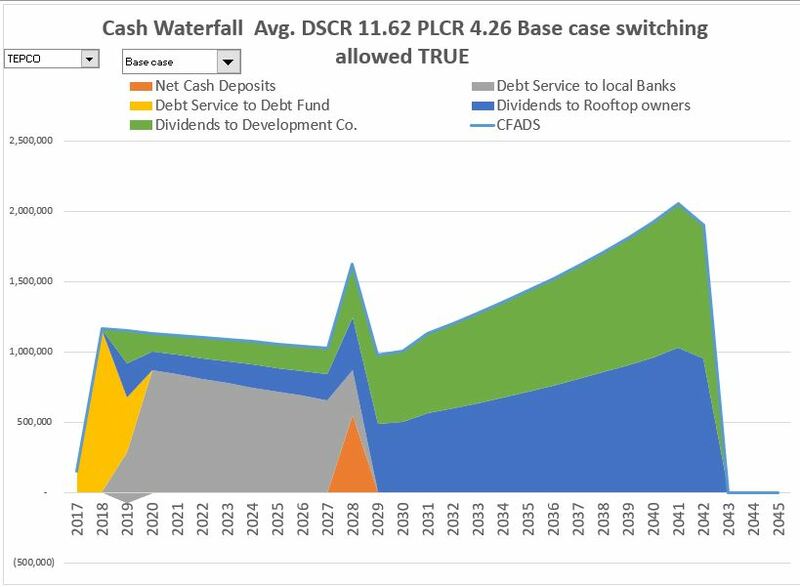 The third solar project finance model file demonstrates how to systematically evaluate the cases where some cash flows are in different currencies. For example, the debt may be in Rupiah while the capital expenditures are in euro. The model demonstrates that the starting point is to evaluate inflation rates in different currencies and the relationship between inflation rates and exchange rates. The approach uses purchasing power parity as a starting point and then allows deviation from the parity exchange rate. A fourth solar project finance model describes how to put a series of smaller projects that are structured as separate SPV’s. In this file you create a template of a single project at an industrial facility. With this single template, you copy it to separate sheets using a macro. This creates a new sheet for the facility. Then you can use the INDIRECT function to consolidate the different sheets. The complete solar model was made a few years ago and has comprehensive circular reference resolution. It also includes resource analysis from PVSYST. I hope to have explained the process of evaluating performance ratios and financial structuring a bit in the video below that I made a long time ago. You can download the file below. But please, it is much better to do this stuff yourself. You can do this by using the circular reference template and attaching it to your solar model. 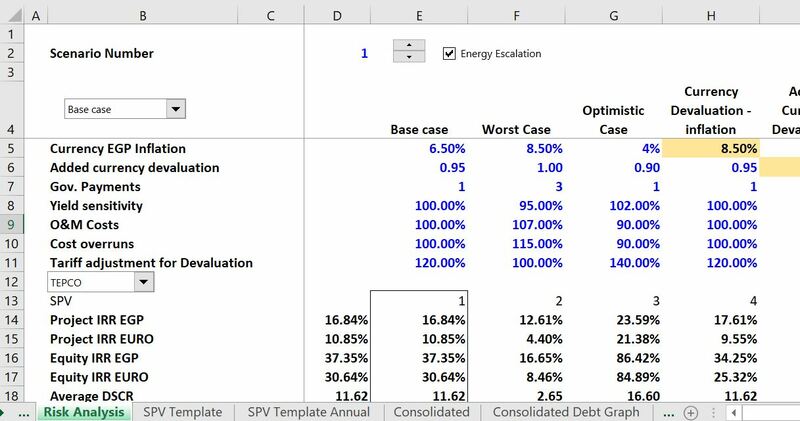 The file below demonstrates how to systematically evaluate the effect of different cash flows in different currencies using a solar model example. The model demonstrates that the starting point is to evaluate inflation rates in different currencies and exchange rates. This files uses purchasing power parity as a starting point and then allows deviation from the parity exchange rate. The exchange rate could also be entered using future exchange rates. To implement the model, the revenues, the financing needs, the debt flows and other items are computed in dual currencies and different currencies can be chosen. Find How to Evaluate Solar Resources and Instructions on How to Create the Project Finance Model that Resolves Circular References Elsewhere on the Website. Some people have asked me how to make one of these project finance models that does all of this stuff, most important of which is resolving the painful circular references. The project finance exercise page that walks through a model from A-Z explains the process. If you have the patience to work through these exercises and long videos you can become a top-notch modeller. Find much more details on how to prepare an analysis of solar resources using websites that publish solar power data and my article on things like the performance ratio and the financial performance of solar suppliers. See how to efficiently retrieve data from websites and monitor the cost of modules (panels). If you want to build sensitivity analysis into your model with spinner buttons that are flexible and can be re-set, you can go to the sensitivity analysis page. This page of the website contains an example of a solar model sensitivity analysis and explains how to incorporate the sensitivity analysis in your models. The three files not include some of the detailed tax aspects of solar financing in the U.S. related to partnership and tax equity. If you want to see how to model these financing structures, go to the tax equity structuring page. The file available for download below includes separate SPV’s for solar facilities. You set up names of the different facilities with the start dates, capacities, construction periods, yields and other factors. Then you can copy the template for a single SPV to other SPV’s. After creating the SPV’s and the sheet names, you can consolidate the SPV’s and put in financing. Finally, you can evaluate how the consolidated financing works with different scenarios and see how fast the loan can be paid off. The file is available for downloading by clicking on the button below. A few screenshots may give you an idea of how the file works. The first picture is intended to give you an idea of how the final consolidated process works. 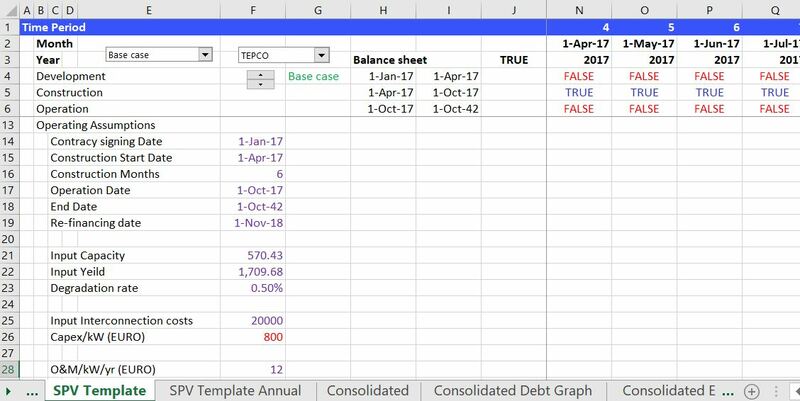 This consolidation works by using the INDIRECT function to add together cash flows and balances from individual sheets. The next screenshots illustrate how the individual SPV’s are set-up. The name of the SPV is the same sheet name. You create an SPV that demonstrates how the different inputs and structure for a single SPV are Created. The date of starting construction, the construction costs, the yield and other inputs are included in the summary sheet. The third set of screenshots demonstrate the outputs of individual SPV’s that are eventually rolled-up into the consolidated analysis. 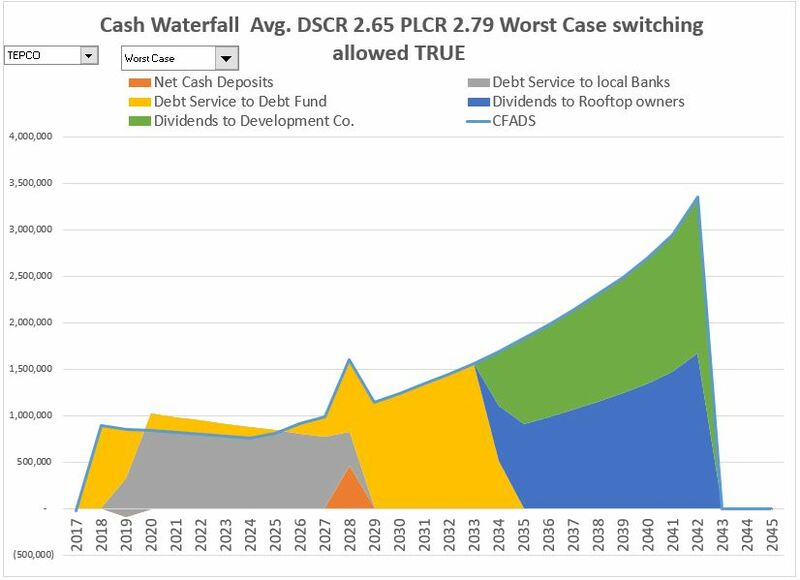 The graphs show how debt service is paid at the individual SPV and how the individual SPV receives cash flow from the solar project in different scenario cases. One of the files below is a file that automatically downloads information from the website www.pvinsights.com. As shown in the screenshot below, the cost of panels has declined dramatically over the past few years so that it is in April 2018 around USD 300 per kW. There have been EPC proposals that include inverters, wiring and support structures lower than USD 600 per kWp. When people say that the cost is higher in African Countries because of bribes, import duties, bad roads, panel stealing, you should say BS. When the IFC says they need a credit spread of 5% plus PRI plus other insurance, you should say BS. When investors say they need 20% return because of a Damaroden study, you should say BS. An example of a silly project in India is shown below. The costs are very reasonable but the returns are not. This makes a project that could have had a tariff of about 3 US cents per kWh have a tariff of more than 8 cents.